Felipe Massa insists he is not playing second fiddle to Fernando Alonso in the wake of the 'team orders' controversy at the German Grand Prix. The Italian team appeared to give Massa a coded order to allow Alonso through to win and have been fined $100,000 and could yet face further punishment. 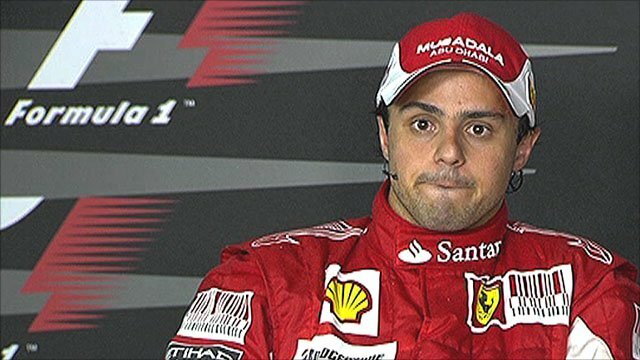 Massa said: "When I say I am a number two driver, I will not race any more. "I've spoken to everyone inside the [Ferrari] team - and I'm not just here to race, I'm here to win." The Brazilian was leading with 18 laps to go at Hockenheim when his race engineer Rob Smedley told him: "Fernando is faster than you. Can you confirm you understand?" 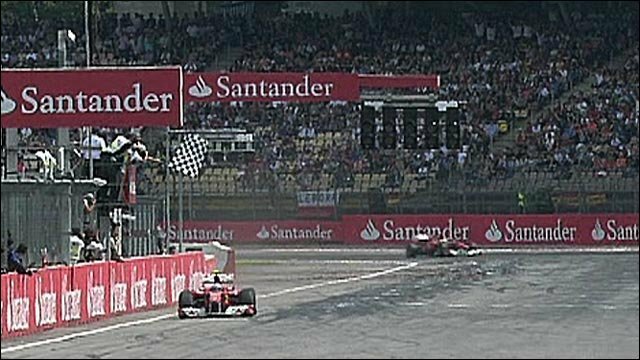 - to which the Brazilian responded by letting Alonso through a lap later. 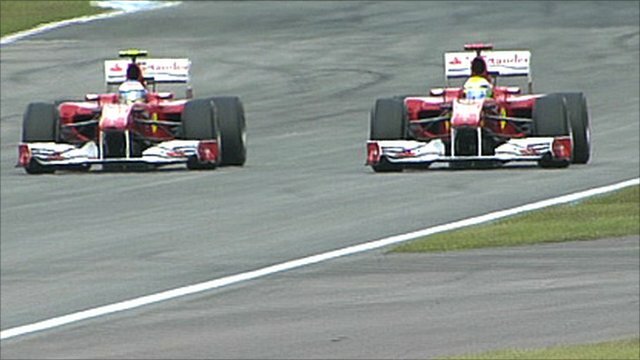 Alonso went on to win the race with Massa second. The Spaniard insisted on Thursday that the events in Germany did not mean he was now Ferrari's de facto number one driver. "There is not a number one and number two driver," Alonso said. "It is more about respect of each other, of racing for the Scuderia (Ferrari), which means a lot." Alonso refused to comment further on the incident, saying his focus was now on getting the best result possible in Hungary this weekend. "There are many opinions, many things have been said in the last couple of days," he said. "The only important thing for us is the car is competitive and we can do well here in Hungary as well. We respect other people's opinions, but we concentrate on our own job." Since the German Grand Prix, fierce debate has raged over team orders, which are banned in F1 - and on top of their fine, Ferrari have been referred to the World Council of the sport's governing body, the FIA, which could impose further punishment. A number of senior figures have said they feel the ban on team orders is unworkable and should be removed. Many observers within the sport, such as former team owner Eddie Jordan, have also stated their view that Ferrari believe the best way to win the championship is for Alonso to be the main driver . But Massa insists he will not be held back. "I can fight for the victory," he told reporters ahead of this weekend's Hungarian GP. "I work for the team and I'm very professional. "It's not right to go into last weekend, we spoke already a lot. So yes I will fight for the victory here whatever the conditions. I'm working for the team and we know how important that is." Asked what he would do if the same situation arose again on Sunday, Massa - who insisted after the race that it was his decision to let Alonso pass - simply responded by saying: "I will win." He added: "You know that sometimes you have difficult times but you always learn, and think forward in your career and in your life. I'm very strong and looking forward to the victory." Alonso is now 34 points behind McLaren's championship leader Lewis Hamilton with eight races remaining - there are 25 points for a race win. Massa, who had failed to score a single point in the previous three races, is 38 points adrift of his Spanish team-mate. Along with the controversy following Germany, Massa's return to the Hungaroring this weekend will be an emotional one coming a year after fracturing his skull in a near-fatal accident at the track . The 29-year-old was hit on the helmet by a spring during qualifying for the 2009 race and paid a visit to the medical staff who helped save him on Thursday. Asked if he would think about what happened last year when he races this weekend, Massa was unequivocal. "No," he stated. "It's really nothing to do with my way of working. "I don't remember a single thing from the accident. When you close the visor you do not think about these things. You just think about doing your best."